Soil compaction occurs when moist or wet soil aggregates are pressed together and the pore space between them is reduced. Compaction changes soil structure, reduces the size and continuity of pores, and increases soil density (bulk density). Wheel traffic or pressure (weight per unit area) exerted on the soil surface by large animals, vehicles, and people can cause soil compaction. 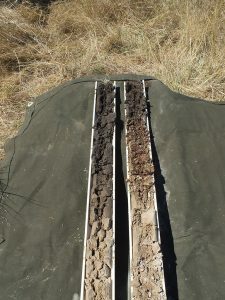 In areas of rangeland, compacted soil layers are generally at the soil surface or less than 6 inches below the surface, although they can be as deep as 2 feet under heavily used tracks and roads. Increases in density can be small to large. When is compaction a problem? Compaction changes several structural characteristics and functions of the soil. It is a problem when the increased soil density and the decreased pore space limit water infiltration, percolation, and storage; plant growth; or nutrient cycling. Water movement and storage.—Compaction reduces the capacity of the soil to hold water and the rate of water movement through soil. It limits water infiltration and causes increased runoff and, in some areas, increased erosion. Compacted wheel tracks or trails can concentrate runoff that can create rills or gullies, especially on steep slopes. When the amount of water that enters the soil is reduced, less water is available for plant growth and percolation to deep root zones. Water entering the soil can perch on a subsurface compacted layer, saturating the soil to or near the surface or ponding on the surface. This water readily evaporates. 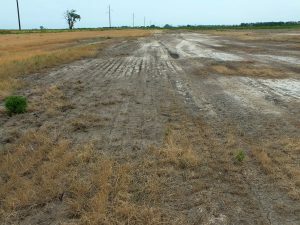 Compaction can increase the water-holding capacity of sandy soils. An increase in the amount of water stored near the soil surface and a decrease in the amount of water deeper in the soil may favor the shallower rooted annuals over the deeper rooted plant species, such as shrubs. Plant growth.—Where soil density increases significantly, it limits plant growth by physically restricting root growth. Severe compaction can limit roots to the upper soil layers, effectively cutting off access to the water and nutrients stored deeper in the soil. Anaerobic conditions (lack of oxygen) can develop in or above the compacted layer during wet periods, further limiting root growth. Even in arid climates, anaerobic conditions can occur where water accumulates. Nutrient cycling.—Compaction alters soil moisture and temperature, which control microbial activity in the soil and the release of nutrients to plants. Anaerobic conditions increase the loss of soil nitrogen through microbial activity. Compaction changes the depth and pattern of root growth. This change affects the contributions of roots to soil organic matter and nutrients. Compaction compresses the soil, reducing the number of large pores. This reduction can restrict the habitat for the larger soil organisms that play a role in nutrient cycling and thus can reduce the number of these organisms. How can compacted soil layers be identified? restricted, flattened, turned, horizontal, or stubby plant roots. Because some soils that are not compacted exhibit these features, refer to a soil survey report for information about the inherent characteristics of the soil. 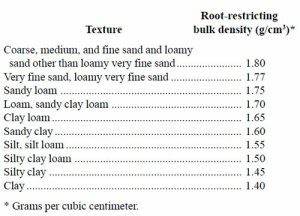 Each soil texture has a minimum bulk density (weight of soil divided by its volume) at which root-restricting conditions may occur, although the restriction also depends on the plant species. What affects the ability of soil to resist compaction? Moisture.—Dry soils are much more resistant to compaction than moist or wet soils. Soils that are wet for long periods, such as those on north-facing slopes and those on the lower parts of the landscape, where they receive runoff, are susceptible to compaction for longer periods than other soils. Saturated soils lose the strength to resist the deformation caused by trampling and wheeled traffic. They become fluid and turn into “mud” when compressed. Texture.—Sandy loams, loams, and sandy clay loams are more easily compacted than other soils. Gravelly soils are less susceptible to compaction than nongravelly soils. Soil structure.—Soils with well developed structure and high aggregate stability have greater strength to resist compression than other soils. Plants and soil organic matter.—Near-surface roots, plant litter, and above-ground plant parts reduce the susceptibility to compaction by helping to cushion impacts. Vegetation also adds soil organic matter, which strengthens the soil, making it more resistant to compaction. What breaks up a compacted layer? Natural recovery is often slow, taking years to decades or more. Cycles of wetting and drying and of shrinking and swelling can break down compacted layers, especially in clays and clay loams. Deep compaction occurs in smaller areas than shallow compaction, but it persists longer because it is less affected by the soil expansion caused by freezing. Shallow compaction may be very persistent, however, in areas that are not subject to freezing and thawing. Roots help to break up compacted layers by forcing their way between soil particles. Plants with large taproots are more effective at penetrating and loosening deep compacted layers, while shallow, fibrous root systems can break up compacted layers near the surface. Roots also reduce compaction by providing food that increases the activity of soil organisms. Large soil organisms, such as earthworms, ants, and termites, move soil particles as they burrow through the soil. Small mammals that tunnel through and mix the soil also are important in some plant communities. Minimize grazing, recreational use, and vehicular traffic when the soils are wet. Use only designated trails or roads; reduce the number of trips. Do not harvest hay when the soils are wet. Maintain or increase the content of organic matter in the soil by improving the plant cover and plant production. Written collaboratively by Dwayne Beck and Ruth Beck. Salts Occur Naturally in South Dakota Soils. A soil has been described as a porous medium consisting of minerals, water, gases, organic matter, and microorganisms. The largest component of soil is the mineral portion, which makes up approximately 45% to 49% of the volume. Some of the mineral portion consists of primary mineral particles. These are the sand and silt particles. Some of the mineral portion is made up of secondary minerals that result from the weathering of primary minerals into secondary minerals like silicate clays. This process results in the releasing of important plant nutrient ions and other elements that make up the remainder of the mineral fraction. The ions attach to the soil clays and soil organic matter or react with other ions to form low-solubility compounds like lime (calcium carbonate) and gypsum (calcium sulfate). These compounds are correctly known as salts but are quite different from table salt (sodium chloride). When they are present at normal levels they help to stabilize the soil particles, buffer the soil pH, and serve as a source of soil nutrients. If these salts are not present in sufficient levels, nutrient deficiencies occur, soil pH is low, and soils may lack structure. The reason for soil testing is to determine the level of soluble minerals in the soil so the ones in short supply can be added as fertilizers or other amendments. If certain elements are present in very high levels there may be problems with the availability of other elements due to competition or insolubility. Excess of other elements can lead to toxicity, high pH, or in the case of sodium, destabilization of the soil’s structure. If the concentration of all salts is too high their presence can hinder plant growth because the ions compete with plants for water. A soil conductivity test is used to determine the extent this is happening. Soil organic matter is that fraction of the soil composed of anything that once lived. It includes plant and animal remains in various stages of decomposition, cells and tissues of soil organisms, and substances from plant roots and soil microbes. Well-decomposed organic matter forms humus, a dark brown, porous, spongy material that has a pleasant, earthy smell. In most soils, the organic matter accounts for less than about 5% of the volume. What does organic matter do? reduces the negative environmental effects of pesticides, heavy metals, and many other pollutants. 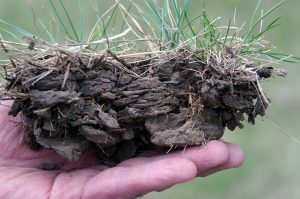 Soil organic matter also improves tilth in the surface horizons, reduces crusting, increases the rate of water infiltration, reduces runoff, and facilitates penetration of plant roots. Plants produce organic compounds by using the energy of sunlight to combine carbon dioxide from the atmosphere with water from the soil. Soil organic matter is created by the cycling of these organic compounds in plants, animals, and microorganisms into the soil. What happens to soil organic matter? Soil organic matter can be lost through erosion. This process selectively detaches and transports particles on the soil surface that have the highest content of organic matter. Soil organic matter is also utilized by soil microorganisms as energy and nutrients to support their own life processes. Some of the material is incorporated into the microbes, but most is released as carbon dioxide and water. Some nitrogen is released in gaseous form, but some is retained, along with most of the phosphorus and sulfur. When soils are tilled, organic matter is decomposed faster because of changes in water, aeration, and temperature conditions. The amount of organic matter lost after clearing a wooded area or tilling native grassland varies according to the kind of soil, but most organic matter is lost within the first 10 years. Rates of decomposition are very low at temperatures below 38 oF (4 oC) but rise steadily with increasing temperature to at least 102 oF (40 oC) and with water content until air becomes limiting. Losses are higher with aerobic decomposition (with oxygen) than with anaerobic decomposition (in excessively wet soils). Available nitrogen also promotes organic matter decomposition. The amount of soil organic matter is controlled by a balance between additions of plant and animal materials and losses by decomposition. Both additions and losses are very strongly controlled by management activities. the intensity of sunlight, the content of carbon dioxide in the atmosphere, and relative humidity. The proportion of the total plant biomass that reaches the soil as a source of organic matter depends largely on the amounts consumed by mammals and insects, destroyed by fire, or produced and harvested for human use. increasing the use of bare fallow. fertilization (especially with excess nitrogen). applying plant materials from other areas. keeping the soil cool with vegetative cover.